The twisting lanes and snug villages in the Dedham Vale on the Essex / Suffolk border are so ridiculously easy on the eye that I can feel myself turning into a dreaded Sunday Afternoon Driver – the sort that drive at half the national speed limit in order to ‘drink it all in’. This little corner of Essex retains a sleepy, chocolate box charm and assuming it’s changed little in two hundred years, it's not hard to see why John Constable, one of Britain's best loved artists rarely strayed far from his Essex birthplace. "I should paint my own places best" he wrote to a friend in 1821. 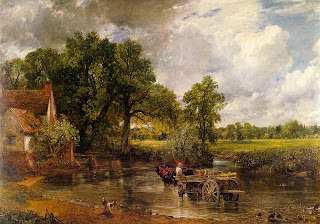 His most famous work, The Hay Wain (above, which was voted the second best painting in Britain in 2005*), depicts a view across the river near Flatford Mill, which was owned by his father, a wealthy corn merchant. Keen to immerse myself in all this spectacular scenery, I decided to follow the National Trust’s 7 mile walk from Manningtree to Flatford, via Dedham - which passes through open fields and woodland and weaves across the bridges and sluice gates of the River Stour. As I made my way along the tranquil but well-trodden route, the tall oak and beech trees, now flushed with vivid green, the lush meadows and the iridescent river water arranged themselves into countless wonderful compositions - just ripe for painting. In fact around each corner there seemed to be a familiar tableau - and as Willy Lott's white painted cottage came into view, my heart leapt slightly with a feeling like I'd been there before. This called for a pit stop - a few moments to appreciate one of Britain's most famous and idyllic pastoral scenes. The hay wain and its heavy horses are now long gone but the mill pond and cottage remain unscathed by their enduring celebrity. Later, in the National Trust's beautiful river-side tea room, I decided that I would buy a sketch book and some pencils at the very next opportunity. Now seems like the perfect time to attempt a stirring of the hitherto unrealised promise I showed as an artist (at primary school). * What was Britain's no. 1 greatest painting? JMW Turner’s ‘The Fighting Temeraire’.